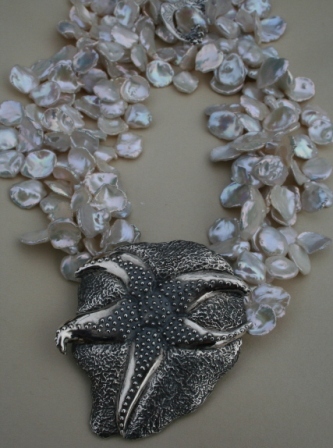 I designed this piece with white Keshi pearls, a sterling silver handcrafted clasp in the shape of Irish Moss Seaweed. The Sea Star is shown awakening on the bottom of the ocean floor and stretches to begin a day of wonder for all who come across this beautiful sea creature while swimming in the azure waters of Turks & Caicos. Truly a sight worth recreating. Wearable Art Jewelry.